LEFT: David Easley, a database administrator at energy service provider Babcock & Wilcox Co., navigated the warren of vendors’ booths at PASS Summit 2011 in Seattle in his kilt. Easley, whose family is Scottish, wore an official clan MacDonald tartan at the Professional Association of SQL Server’s annual conference in honor of the Women in Technology group and completed the outfit with a pair of Vibram FiveFingers shoes. Still, it was the exotic clothing that drew so much attention that day in October. “I’ve had lots of people tell me it was a great kilt,” he said. RIGHT: Grant Fritchey, product manager in Grafton, Mass. 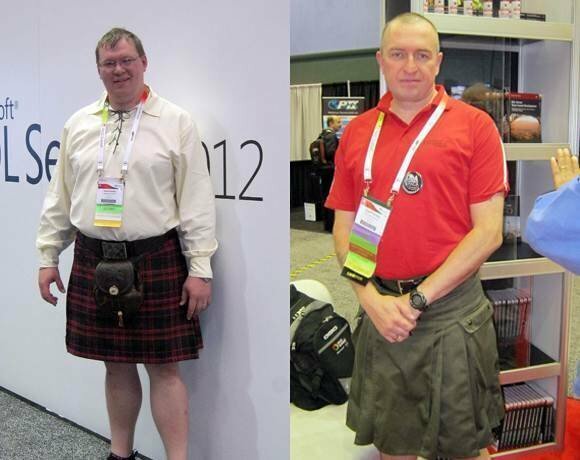 at Red Gate Software, started the tradition of wearing kilts at the PASS Summit by taking on a dare in the summer of 2009, a few months before the conference. The word was out with a tweet. “In my capacity as nothing at all I declared day two SQL Kilt Day.” Three men wore kilts that year -- Fritchey, Steve Jones, editor in chief of SQLServerCentral.com, and Bill Fellows, database developer and author of the World of Whatever blog. “The first year it was pretty freaky -- three guys running around in kilts,” Fritchey said. His workman-style kilt comes from Seattle-based garment maker Utilikilts.